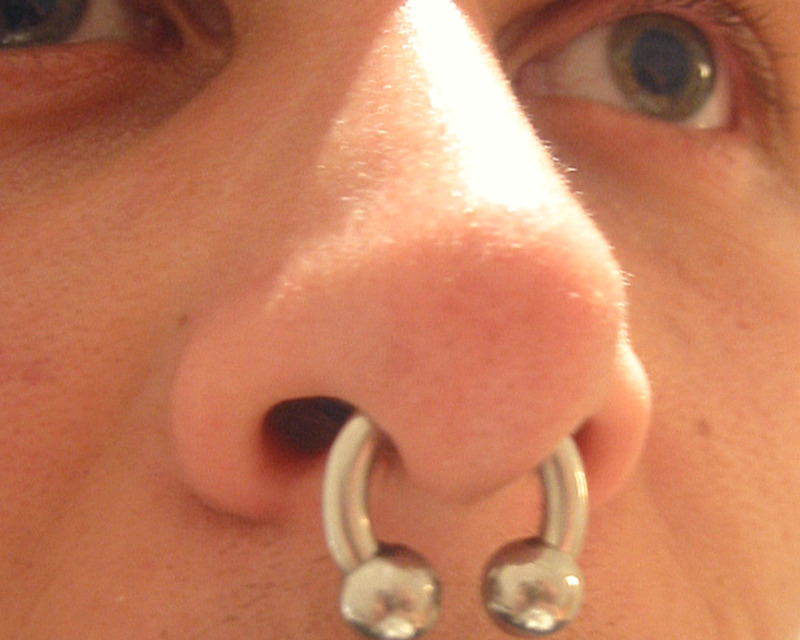 Today, fewer employers completely ban nose piercings, although some may ask that workers pick flesh-colored jewelry or require only studs of a particular size or shape. If you work outside of your home, be sure to keep your workplace’s policies in mind when choosing your starter jewelry—or you may be forced to make the painful decision between losing your piercing or losing your job. It is very important to select jewelry that suits your body and lifestyle, as well. If you’re active, you’ll want to choose something that doesn’t get in the way of that activity. If you’re sensitive to certain metals, it’s important to keep that in mind, too. For your first nose jewelry, you may want to choose something simple and as conducive to healing as possible. This isn’t the time to choose a Hello Kitty nose ring, nose bone jewelry, or some other outlandish style that may cause issues not only in healing but at work and/or school. If you’ll need to have the option of hiding your piercing, how to plan accordingly. Knowing what’s going to happen when you get pierced will help you understand why jewelry choice is so important. Next, the piercer marks the spot with a pen. They’ll ask you to look in a mirror to make sure the spot is properly placed. Then they’ll gently clamp your nose with an instrument that holds it steadily in place. Next, they’ll push the hollow needle through with one quick movement. This is when you’ll feel the most pain—it will be sharp and quick. Finally, the’ll insert the jewelry. This can sometimes be a bit painful, too. You’ll leave this jewelry in until entirely healed, so choose wisely! Lastly, they’ll carefully re-sterilize the area. 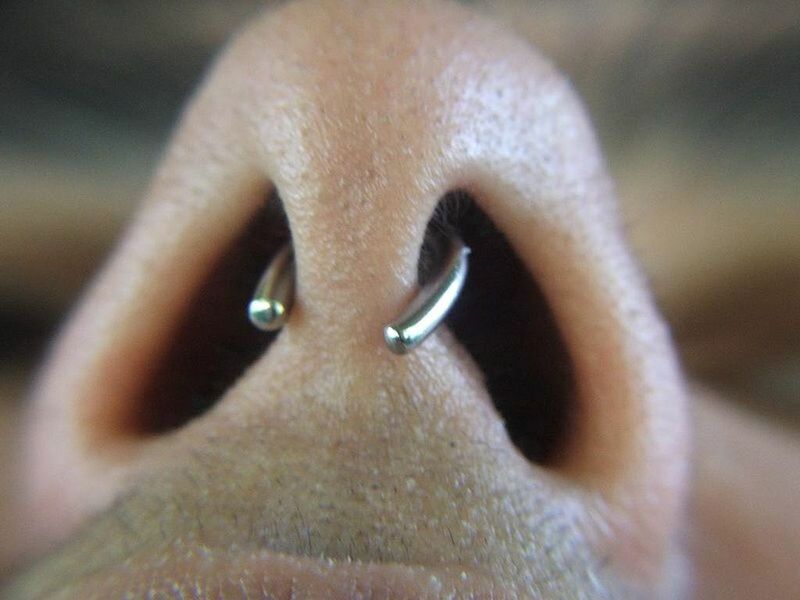 Rhino piercings (done vertically, through the tip of the nose)takefrom 6 to 9 months. It’s hard to say. For comparison’s sake, It will likely hurt more than getting your ears pierced, and a septum piercing will be an added degree of pain. But getting a nostril pierced should be significantly less painful than a cartilage piercing. If you’ve never been pierced, you might describe the pain to is sharp, quick, and ultimately bearable, although you’ll feel a dull ache for a few days afterwards. If you have a low pain threshold, you should consider the thinnest jewelry —those would be the 20 gauge ones. The lower the number of the gauge, the bigger the hole that’s required for the piercing. For example, this means that a 16 gauge piercing is bigger than a 20 gauge one. Make sure to use a reputable piercer who has the right kinds of tools. If you ask your cousin to pierce your nose with a plastic piercing gun, you’ll certainly feel a lot more pain. Titanium. Implant-grade titanium G23 is biocompatible (agrees with your body), resistant to body fluids, and nickel-free. It’s relatively expensive, but you don’t want to mess with inferior metals until you’re fully healed. Surgical Stainless Steel (SSS): Heavier and less expensive than titanium. 316L or 316LVM grades are safe to wear in healed piercings, but even the best grades have nickel in them and may cause problems if you’re sensitive to nickel, and that’s why it’s best to save even the implant-grade SSS jewelry until you’re already healed. Gold. Even more expensive than titanium, but if you can afford it, it is a good option. However, since gold is a soft metal and does contain alloys, there is the risk of irritation and reaction. For this reason, it’s best to wait until you’ve healed to change to gold, and if you do, avoid any jewelry that is less than 14k gold—the higher the karat, the better. Glass can be a safe jewelry material, but since there’s no universal standardization or labeling for implant-grade glass, you usually can’t be sure what you’re getting. Glass works only if it’s lead-free: soda-lime, fused quartz, or borosilicate glass might all be fine for an old (healed) piercing, but glass is never used for initial piercings because of sizing issues. It tends to run large, so something called “18 gauge” is often thicker than that, and if a piercer uses an 18 gauge needle, they’ll have a lot of trouble cramming that glass in. Remember: the thinner the glass, the more fragile it is, which can lead to risk of injury. Plated Jewelry or “Mystery” Metal. Since you don’t know what its made of, its never a good idea to buy cheap, questionable jewelry. You may save money but you’ll probably end up throwing that jewelry away when it starts to discolor and irritate your body. Plastic or Nylon. These materials are soft, degradable, and difficult to clean, so they’re not suitable for nose piercings. You can’t change your nose ring for at least several weeks while it’s healing. A simple stud makes a great starter for most people. You can then change to whatever suits your tastes better when that time comes. Nostril screws have straight post wires that go through your piercing and end with a bend that holds the jewelry in place. Putting in, removing, and re-inserting a nostril screw can be tricky without practice, but you’ll get used to it. Why can’t I get a really tight-fitting nose hoop, ring, or barbell? A too-tight ring or barbell will pull and irritate the tissue. Because that tissue will be swollen at first and during the initial phases of the healing process, your jewelry will need to fit a little loose in order to accommodate for this. You might not like the way it looks when the jewelry protrudes, but wait until you’re completely healed before you change to something more form-fitting. Consider jewelry made of a discreet material. Some materials are more discreet than others. For a healthy, clean solution, consider a matte titanium anodized in a color that matches your skin tone. Although sensitive people will probably react to jewelry made of clear plastic or flesh-colored acrylic, it might be a solution you’d consider for the short term. Ideally, especially if you’re sensitive or prone to infection, you’d wait six months before changing your nose jewelry. But realistically, you’re likely healed enough after 6 to 8 weeks to change the jewelry, but should only do so if necessary (like if you need to get an x-ray, or if you develop a reaction to the metal). If you must change your jewelry early, then go back to your piercer and have them do it for you. It’s not a good idea to take the jewelry out. Because of the mucus membrane on the the inside wall of a nostril, nose piercings tend to close and heal shut very quickly—even in an hour or two—if jewelry is removed. So only remove jewelry if you have a replacement on hand. Choosing the right person and place to do the piercing is the first important choice you must make. A good piercer can help you avoid countless infections and other problems that could have negative impacts on your wallet and your health. Don’t undervalue the benefit of a professional piercer! For the entire duration of the initial healing process, you must follow your piercer’s aftercare instructions diligently. It’s very important to always wash your hands thoroughly with antibacterial soap before you touch the area around your piercing or change, adjust, or remove the jewelry. Hygiene and cleanliness are very important for keeping your piercings infection-free. 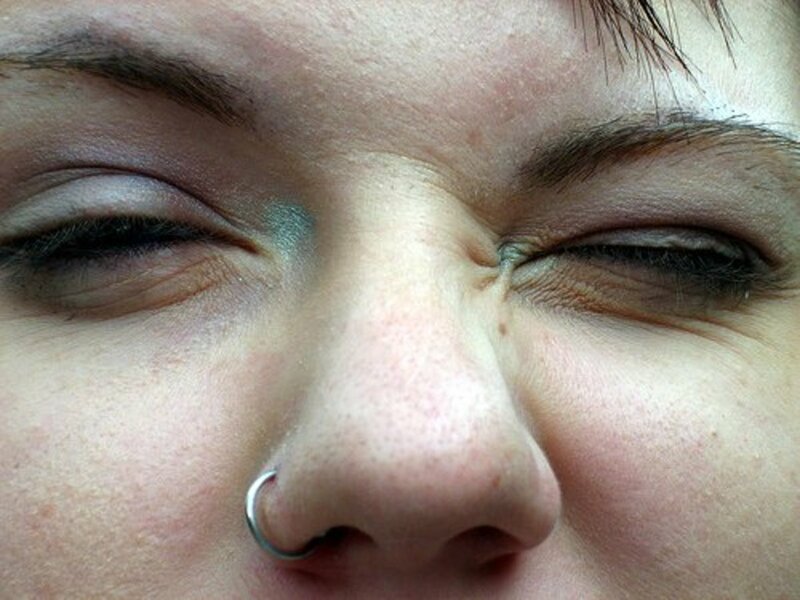 For the other side (inside your nose), use a saline-soaked q-tip to clean and remove any crust. Don’t rub too hard. Don’t apply cosmetics, sunscreen, or other lotions over the piercing site until it’s completely healed. You won’t be able to use make-up to cover your piercing until it is done healing. Why shouldn’t I get my nose pierced with a gun? It’s so cheap and easy! Avoid piercing guns at all costs. They were not built for the job, are likely to cause unnecessary pain, are far less accurate, and more often lead to blood-borne infections and healing complications. Just don’t do it. A hollow needle in the hands of a trained professional is the best choice. A “retainer” is just a type of jewelry but it’s usually extremely plain, because the purpose of a retainer is not to decorate but to simply fill and prevent a piercing from closing up. Next ArticleDo Tongue Piercings Hurt? how long till you could change the nose stud? What Type of Nose Ring Should I Be Pierced With?